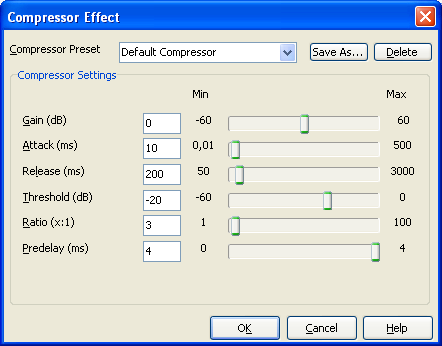 Use Compressor FX to reduce the dynamic range of a sound to avoid unintentional fluctuation in the dynamics. Output gain of signal after compression. Time before compression reaches its full value. Speed at which compression is stopped after input drops below Threshold. Point at which compression begins, in decibels. Compression ratio. The default value is 3, which means 3:1 compression. Time after Threshold is reached before attack phase is started, in milliseconds. Submitted by Anonymous on Thu, 02/23/2017 - 15:18. Submitted by Routy on Fri, 09/02/2016 - 19:42. Super! Its really cool compressor!